President of the Syrian Coalition Abdulrahman Mustafa sent a letter to Secretary-General of the Arab League, Ahmed Aboul Gheit to highlight the series of mass forced displacement operations being carried out by the Assad regime against the local population in various areas across Syria, the most recent of which took place in eastern Ghouta. President Mustafa said that the war crimes did not stop in Syria. He strongly condemned the Assad regime and its allies’ employment of policies violating human rights, including killings, starvation and torture. He stressed that these tactics are aimed at crushing the Syrian people’s revolution and their demands for freedom and dignity. President Mustafa also expressed his deep concern about the dire and mysterious situation surrounding Idlib province, which has become the destination for all the people who are being displaced from other areas. He pointed out that the province is now home to more than two million civilians. Moreover, President Mustafa said that eastern Ghouta was subjected to the largest mass forced displacement operation in the wake of the ruthless onslaught by the Assad regime and Russia forces who used various types of weapons, including internationally prohibited ones in the bombing campaign in the Damascus suburb. He noted that the displaced people were humiliated and starved by pro-regime forces. President Mustafa said that the situation in Idlib has become extremely dire as the new arrivals are being housed in overcrowded shelters and houses amid severe shortages of food and drinking water as well as lack of medical services. He stressed that Syrian civilians continue to suffer as the situation on the ground has become catastrophic because of the failure of the international community to stop the waves of mass forced displacement; protect civilians; and enforce UN Security Council resolutions calling for the cessation of all hostilities and the delivery of humanitarian aid. The Syrian Interim Government (SIG) has conducted a statistical study of the displaced people and has prepared an inventory of their needs in the reception sites, President Mustafa said. He called for the urgent provision of humanitarian and medical assistance for the IDPs via the Syrian Interim Government and in accordance with the needs listed in SIG’s report. 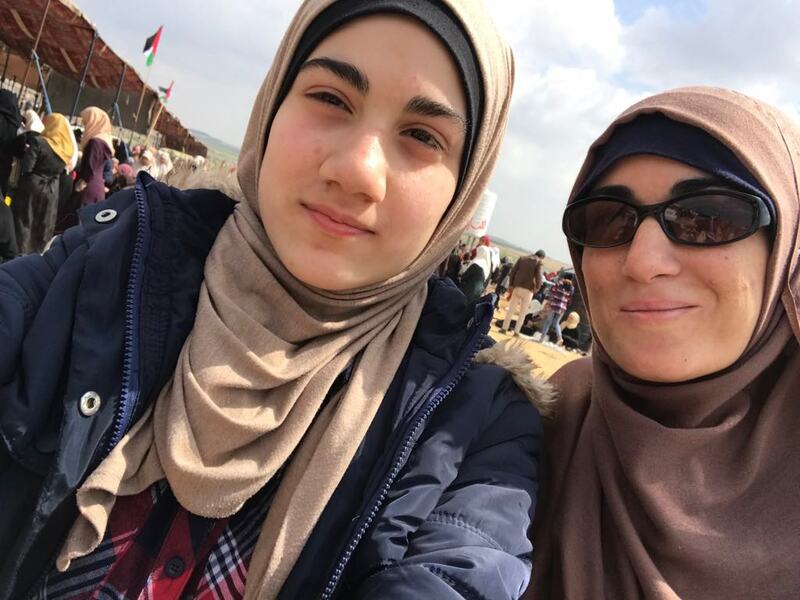 On Land Day, March 30, I set out with my three-year old and 12-year-old children, husband and other family members to join an estimated 30,000 other Gazan Palestinians for the first day of the Great Return March to the border with occupied Palestine [Israel]. Every day until May 15, the anniversary of the Nakba [“catastrophe” when more than 750,000 Palestinians were forced from their homeland during Israel’s creation] we will camp by the border to remind the world that we have a right to return home. It took me 45 minutes to get to the eastern border of Gaza City. We passed through the densely populated neighborhood of Shejaiya, where a terrible massacre took place during the 2014 Israeli war on Gaza. The streets were congested with Friday morning vendors whose faces reflected the miseries and toils of Gaza life. Mule and horse-pulled carts dominated al-Mansoura Street as I rode in the car; I realized I had actually never been to that part of the city before! The fearless ones, mostly young men, ventured close to the border even though they were not armed—they couldn’t resist getting a closer glimpse of their occupied homeland. They were as vulnerable as us women and posed no threat. Yet as they had threatened, Israeli snipers were positioned to kill these dreamers. The Israeli occupation forces also fired teargas canisters at the crowds. The Israeli occupation authorities have completed building the part of the Separation Wall which snakes around the neighbourhood of Azzoun in the south of the occupied West Bank city of Qalqiliya, Al-Resalah reported on Tuesday. The Secretary of Azzoun Village Council, Abdel Karim Ayyoub, said that Israel’s objective in building this wall is rejected by the indigenous population. “It is simply working to impose its occupation policy,” he said. “Israel wants to tighten its grip over Palestinian farmers in the area.” Several complaints have been lodged against the Israeli measures in the area in the hope that the wall will be dismantled. Israel started building the Separation Wall around this neighbourhood in 2002. It is referred to by international activists as the Apartheid Wall and encircles the neighbourhood, isolating it completely from the outside world. The occupation authorities open the gates for just 20 minutes three times a day. The wall at this particular point is 7 kilometres long and between 50 to 70 metres wide (including the clearance zone on either side). It occupies 2,000 dunams (500 acres) of land belonging to the village. She told reporters last month before the court accepted the plea bargain that “there is no justice under occupation and this is an illegitimate court”. 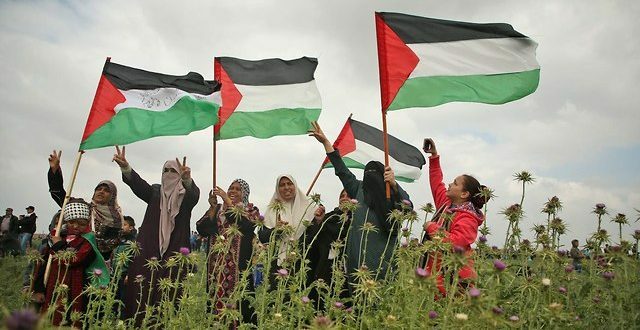 Head of the Coordinating Committee of the Great March of Return Zaher Birawi announced yesterday the formation of an international legal committee of law experts who will attempt to prosecute Israel over killing unarmed Palestinian protesters during the first day of the march. Birawi reiterated that international law guarantees the right to peaceful protests, stressing that opening fire on the protesters while they were calling for the implementation of UN resolutions related to their right to return is a war crime. He said that the committee is seeking to take the Israeli occupation to every international court there is, including the ICC. In the statement Birawi called for all documents, images and videos that are proof of the Israeli army’s crimes against unarmed Palestinian protesters to be submitted to the committee. On Friday, which coincided with Palestine Land Day, Israeli forces shot dead 16 Palestinians and wounded 1,416 others. A total of 350 Palestinian minors are currently languishing in Israeli jails, according to two Palestinian NGOs. Eight girls were among those held in Israeli prisons, the Commission of Detainees and Ex-Detainees Affairs and the Palestinian Prisoners Society said in a joint statement on Wednesday. According to the statement, six children were being held at Israeli juvenile centers. The statement was issued on the occasion of the Palestinian Children’s Day, which is marked on April 5 each year. Israeli forces detained 353 minors since the start of this year, some of whom were later released, the two NGOs said. In January and February, Israeli authorities issued house arrest orders for 102 minors, most of whom were from the occupied East Jerusalem, the statement said. The two NGOs appealed to international rights organizations to intervene to provide protection to Palestinian minors against Israeli practices. According to Palestinian figures, roughly 6,400 Palestinians are currently held in Israeli prisons.